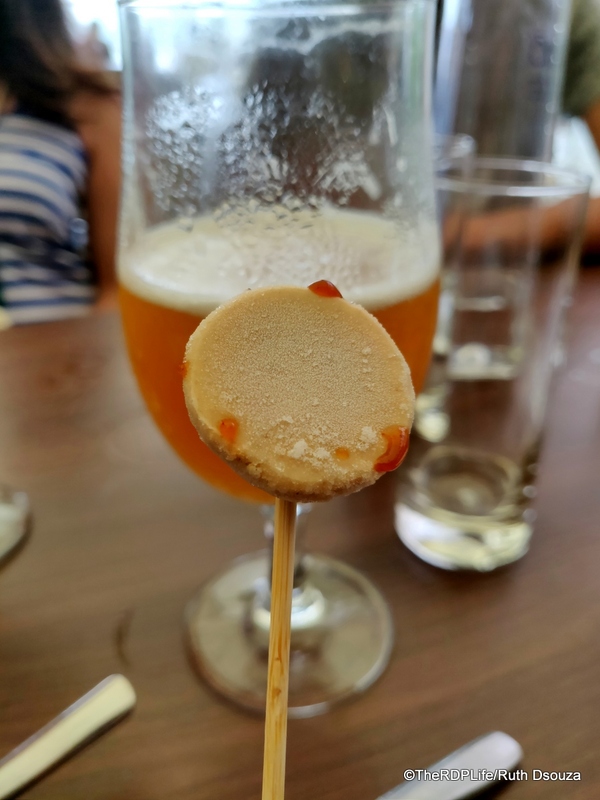 Farzi Cafe has a brand new menu in place and we recently spent a brilliant afternoon sampling it - great food, great company and Farzi's Masala Saison is a winning combination. 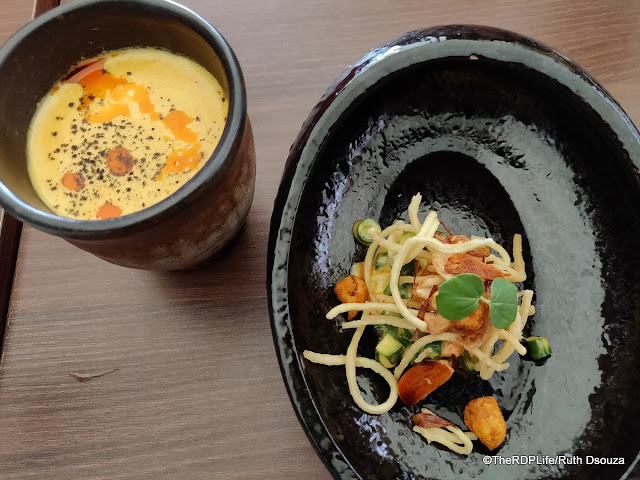 We were invited to experience this menu and pictures will take you through just a part of what the new menu has to offer. 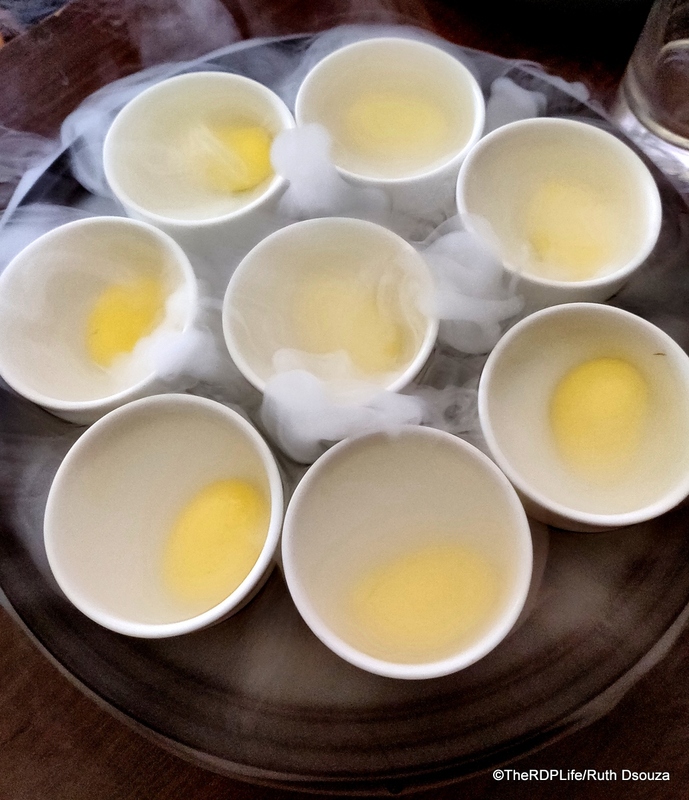 The Amuse Bouche of Mango - some spherification and a bed of dry ice for the drama element. Always a nice way to begin the meal. 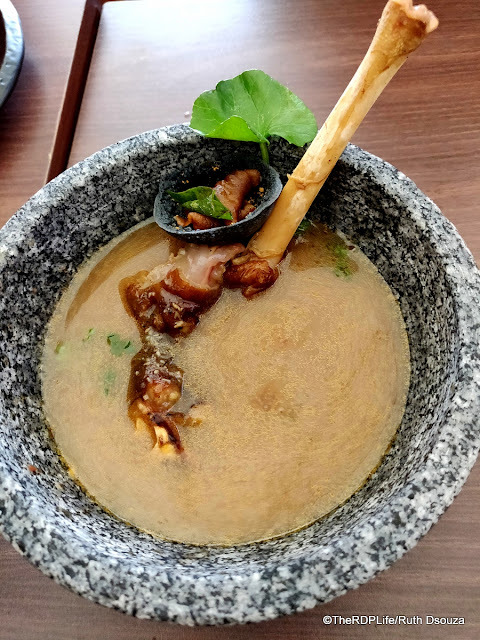 The Khao Suey Soup with Black Garlic Dust (veg) - The soup is poured at the table with flourish. Always good for those pouring shots, if you are like me and always scouting for something nice. 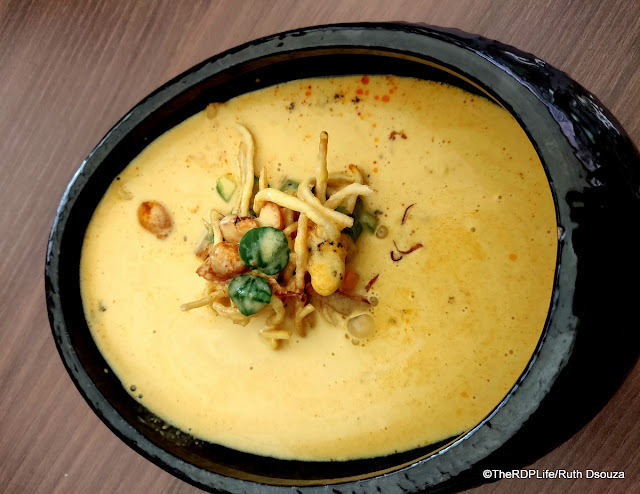 Farzi Cafe, no matter which city it is based in, always takes inspiration from the local cuisine. 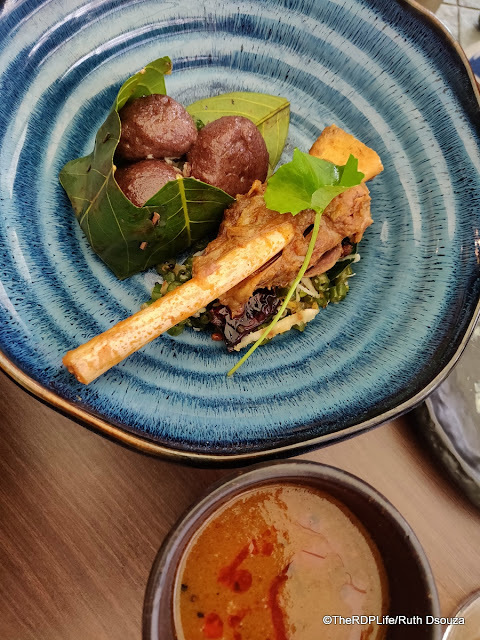 The Paya Shorba was the first of the dishes to go down that path. 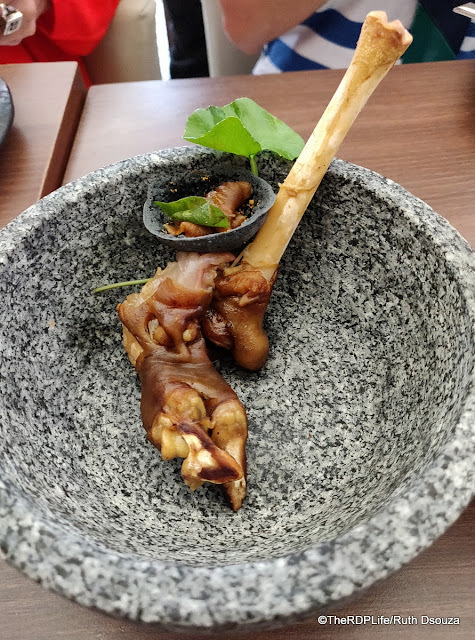 These gorgeous stone bowls come with the trotters in it and the shorba is poured out at the table. The soup has a nice hit of pepper as it should and opens up the senses. A sip of the cold Masala Saison soon after will give you a headiness of a different, happy sort. Being a Mangalorean, the Rotti from Kori Rotti is no stranger to me. Many a coconut chicken gravy I have dunked these rottis into. 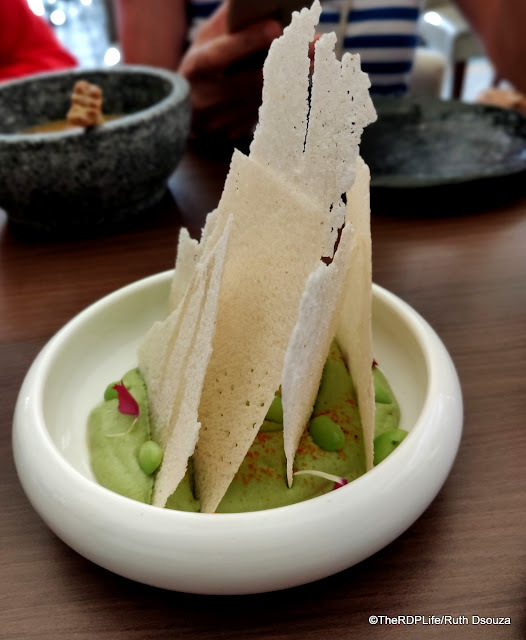 With the Edamame Hummus with Kori Roti Crisp, this was the first time I was using the rotti to scoop up some of the Edamame Hummus and I can tell you for sure that it is as addictive as it comes. Try it. 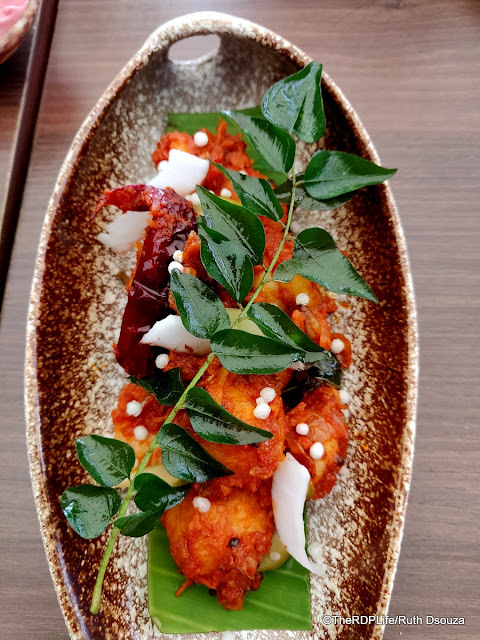 Again, the Mangalore girl in me completely approved of this Squid Rava Fry with Shrimp Dust, Roasted Tomato and Ginger Chutney. I will happily fight anyone at the table for this. 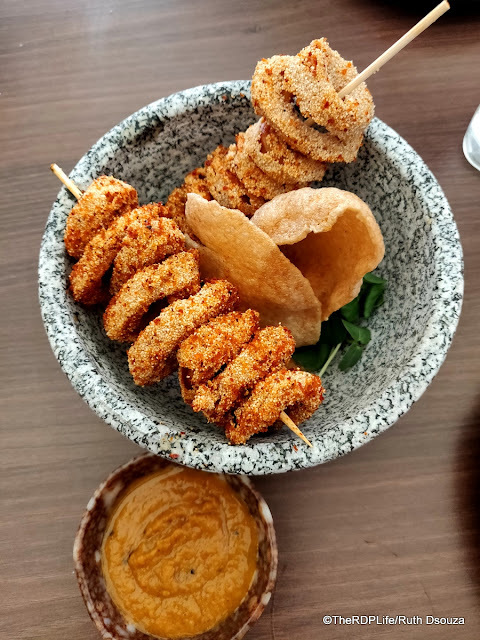 Pretty plating is a part of the deal when you dine at Farzi. While I have found it a bit over-dramatic at times, clean lines and distinct arrangements like this one you see, always gets my attention. I can see all the elements on the plate and know exactly what I am digging into. 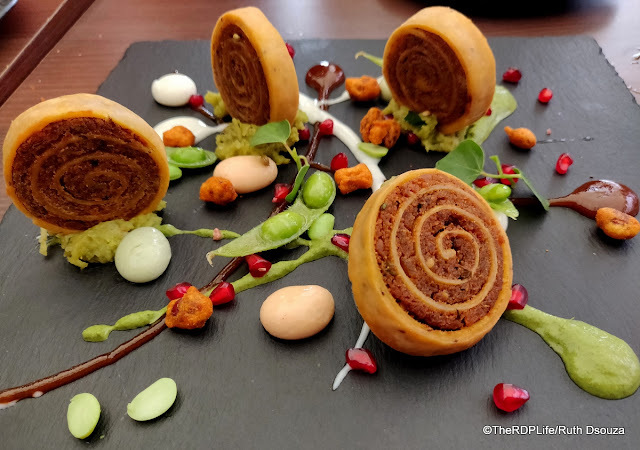 The Edamame and Aloo Samose Pinwheel Chaat was quite the surprising dish and not one that I thought I would like so much, but I did and have been recommending it as well. The aloo filling is what cinches the deal in this dish. 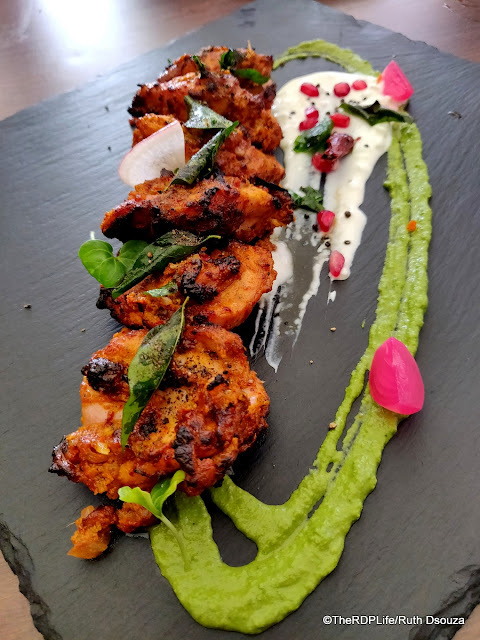 Tellicherry Pepper chicken Tikka - you couldn't ask for more - succulent meat, spicy marinade and some beer and you are set. 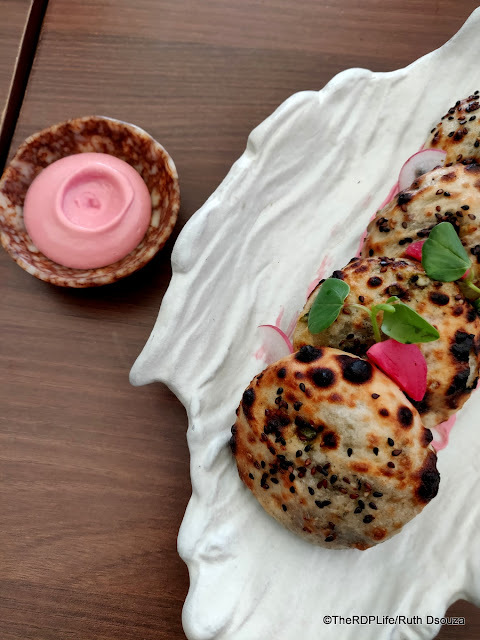 Spinach and Ricotta Kulcha with beetroot garlic cream - While the kulcha was nice, it was the beetroot garlic cream that really stood out for me in this dish. Not too sweet, beautiful colouring and solid punch from the garlic to take on the bitterness of the spinach and the creaminess of the ricotta. 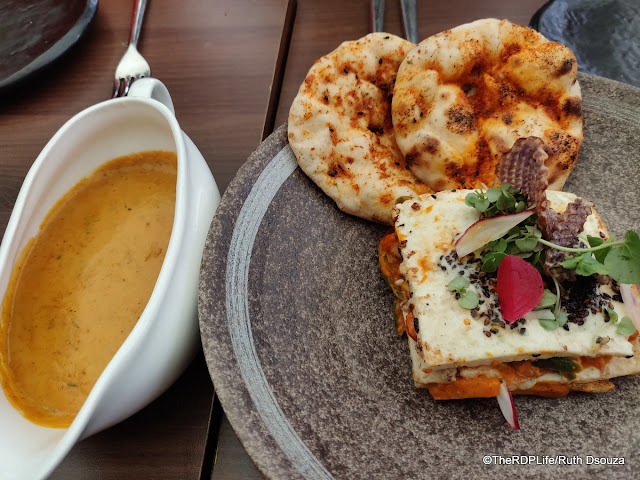 Coming to the mains - we had the Jalfrezi lasagna, potato crisp fried garlic and togarashi Kulcha. Some of the sauce layered on the inside was served in a tureen on the side as well. 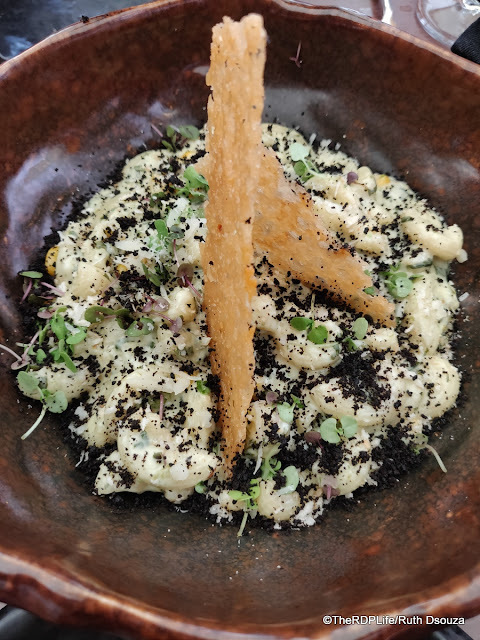 This Methi Makai Mac and Cheese with black olive dust may sound completely off in terms of the elements in it but they come together brilliantly. This is one very good dish and one that even found its way home in a little takeaway bag. 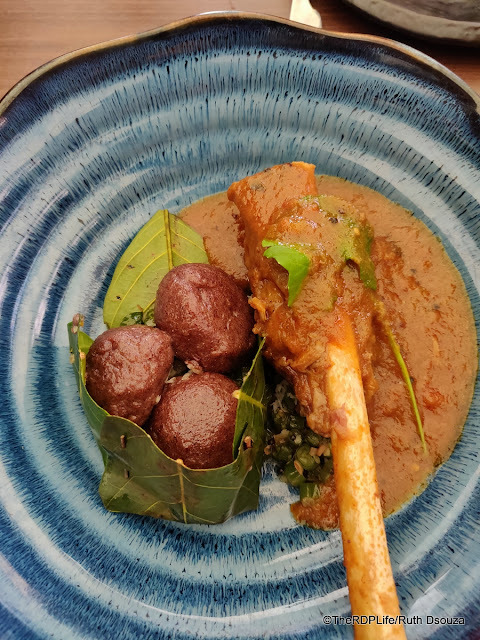 And for those who would like to see country classics like Nati Style mutton mudde curry reach upmarket restaurants like Farzi, here is this one. A really good mutton curry, with mudde on the side. Close my eyes and eat it and I am in one of the military hotels in my part of town. Top notch flavours nailed! 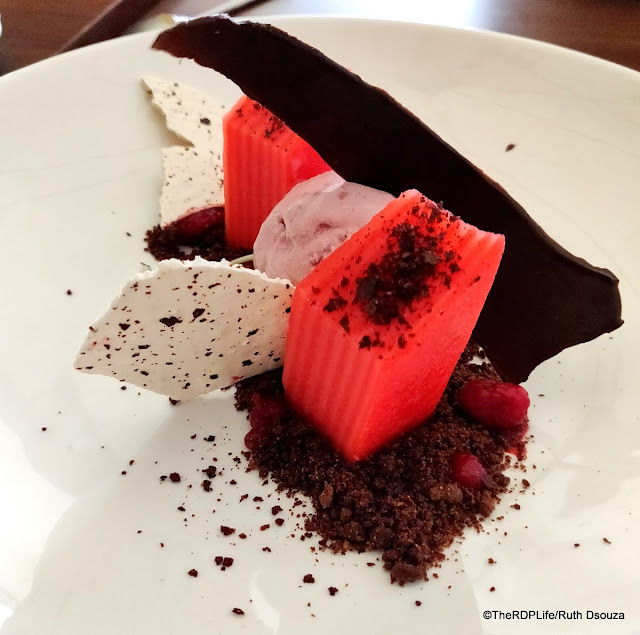 Red Velvet Bebinca, mix berries ice cream - a beautiful variation of the classic Red Velvet and the Bebinca. Light and fruity flavours and the berries adding that lovely juicy burst of flavours. There is a lot more on the new menu that you can choose to have. Do let me know what you try. Average meal for two without alcohol is around Rs 1700.